This article aims to compare two bibles, Sophia bible from Holland and The Mother of Pearl bible from Belgium, both found at the Design Derby Exhibition at the Boijmans van Beuningen museum in Rotterdam. The ‘Sophia bible’ was made by Dutch publishers ‘Uitgeverij van Goor’, a family run business who specialized in Children’s literature. It was made for Queen Sophia and the Dutch King Willem III in 1855. It was called the Sophia bible, after King Willem’s wife Sophia of Württemberg. 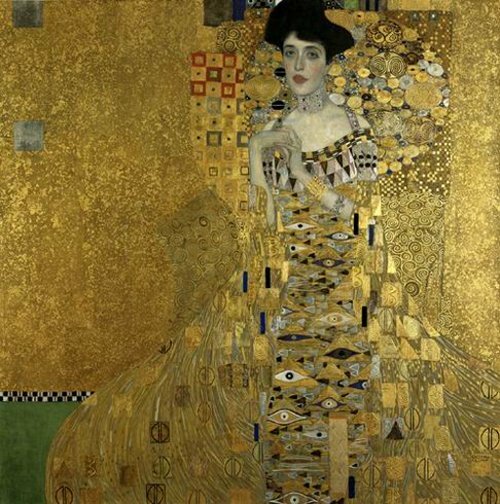 It was for public sale, but two very ornamental copies were reserved for the Royalty. The bible is bound with calf’s skin and velvet, decorated with wooden graphics and golden clasps. Sophia bible is illustrated, suggesting that it’s function was more ornamental than informative. The 19th century was a time of civil unrest in the Netherlands, as there was much conflict between the Protestant and Catholic churches. In 1853, King Willem gave permission for the Roman Catholic bishop hood to be restored. Although the Royalty remained favorable to the Protestant Church, this elaborately decorated bible could have been an attempt for the King to neutralize the differences between the two sides, as it’s ornamental design refers far more to Roman Catholicism, than to the more humble, Protestant style. 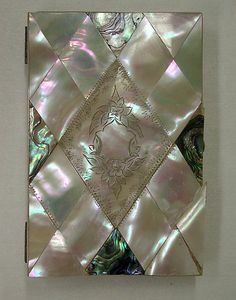 The Mother of Pearl bible, published by the Belgian publishers ‘Brepols‘ in 1882 is a small, silver bible made from Mother of Pearl, gold leaf and copper. It’s Art Deco Style owes to the geometrical triangles, it has a small clasp and is made to be kept close at hand. This may be because the popularity of Christianity was declining in the late 19th century, meaning people wanted to protect and prove their faith. A pocket sized bible would mean people could read from it on the streets, either preaching from it, or using it to prove a Christian identity. In 1882, Belgium was Roman Catholic, so the pearl bible was too. The Belgian publisher ‘Brepols’ was a family run business, who coincidentally also specialized in children’s literature. The two bibles are vastly different, firstly and most notably, in size, sophia bible is very big compare to the pearl bible .They came from two different ideas of how to practice Christianity. The Sophia bible is purely ornamental, the desire to look inside is great, but the idea of using it as book for Christian practice seems less so. The Belgian Pearl bible is used for reading every day and following faith. It’s hard exterior prevents it from damage, so it is designed to be portable. Secondly, the design styles. The Belgian bible follows Art Deco, somewhat unlike the rest of Belgian design in the 19th century. It’s symmetrical triangles, it’s ornamental pearl cover and the small copper clasp make the bible elaborately shiny, but also visually very simple. The Dutch Sophia bible was made in the Style of Art Nouveau. It’s design follows Neo-Classicism and Baroque revival design which was popular in Holland in the 1800’s. 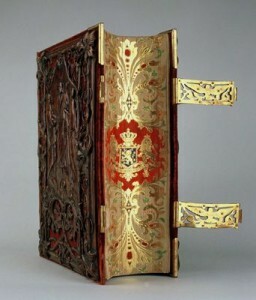 It’s ornate wooden floral patterns, it’s huge golden clasp and it’s royal red binding make the bible decorative, fitting well with the rest of Dutch design from that period. Lastly, there is a difference in the Status of the bibles. The Sophia bible was made for Royalty, already this calls for intricate and decorative design. Before the second half of the twentieth century, there seemed to be an unspoken rule that design for Royalty must be elaborate and ornate and just because of this, it creates a huge bias in the design of this bible. The pearl bible is vastly different as it was made for upper middle class Roman Catholics. 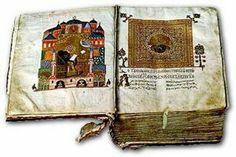 It was designed far more simply, you would not recognize it as a bible unless you looked inside, whereas the Sophia bible gives it away with the ornate effigy of Christ on its cover. In conclusion, these bibles are vastly different. Although both using expensive, decorative materials, one is over-designed looking at it from a 21st century eye, whereas the other is far more simplistic. The pearl bible’s Art Deco design is more modern than the Sophia bible, which screams Art Nouveau. They were used for different purposes, I imagine the pearl bible more actively so than the Sophia bible, owing to it’s sheer size and weight. The Sophia bible is probably more fragile than the pearl one, as it has many thin, decorative wooden features which may not survive a fall from table height. The bibles are 30 years apart which was enough time for design styles to change quickly, especially in the second half of the 19th century. 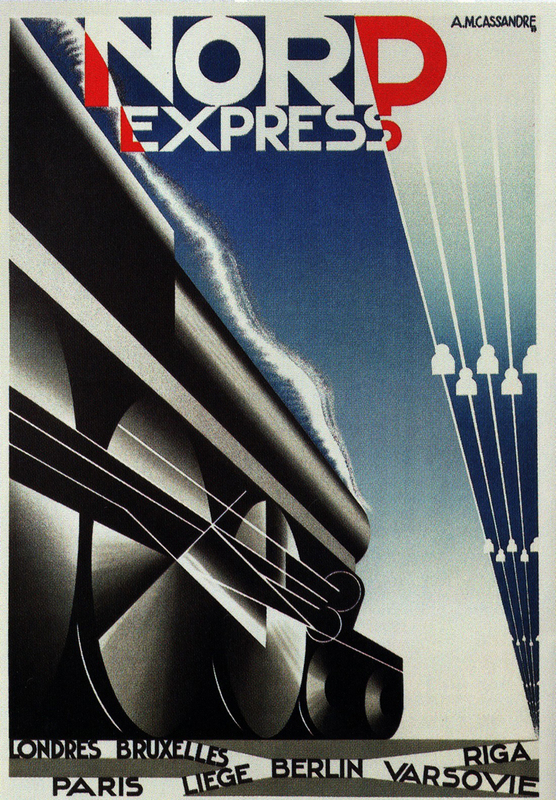 The Nord Express was a poster designed by Adolphe Mouron Cassandre in 1927 promoting the railway line that ran between Paris and St Petersburg. 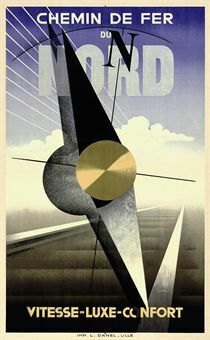 Although the Nord Express rail line was already thirty years old by the time A.M.Cassandre’s poster was printed, the creation of this glamorous advertisement did not just re-promote the long existing rail line, but expressed and symbolised the excitement, glamor and extravaganse of the art-deco age in which the creator A.M.Cassandre was living. Adolphe Marie Mouron Cassandre was born in the Ukraine on the 24th of January 1901. As a young man he traveled to Paris where he studied art at Beaux- art. He was extremely talented and shortly after graduating from Art school he was taken in by a printing company and set to work creating his first advertisements posters. Unsatisfied he, along with several other print makers, soon went on to create their own printing company Alliance Graphique. Here Cassandre really shone. 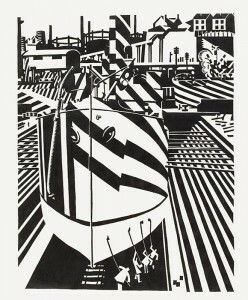 He was accredited with creating innovative new graphic techniques, which drew inspiration from contemporary art movements including surrealism, cubism and above all Art Deco. "Sur la portes de la lumiere" text by Blaisse Cendras /Bifur typeface /Poster for "Chemin du Fer Nord"
The Nord Express, which hangs in the Stadelijk museum in Amsterdam, was a celebration of the age in which Cassandre was living. In its portrayal it brought style and glamour once again to rail travel. Passengers were not just stepping into any mode of transport, they were entering one that was new and thrilling. It was adventurous, a chance to escape to go to places never before dreamed of by the every day man and woman. The composition of the poster was vital to the impression, and Cassandre, influenced by the likes of Pablo Picaso and Max Ernst, handled and executed this very simply. The track is at eye level giving the impression of the train towering over the viewer, perhaps echoing the designs of groundbreaking high-rise buildings that belonged to the same art deco age. As a viewer you get the sense of the giant locomotive speeding towards you, it is frightening and yet thrilling at the same time, the vivid, vibrant. Colours jump out of the poster giving the image a somehow realistic and exciting feel, echoing the artists genius. Cassandra was well known for his inovative portrayal of moving vehicles and there is no better example of this than in the Nord Express. Sharply angled non-parallel lines disappearing into the distance gives the illusion of great speed, viewers could imagine them selves travelling across countries in only a matter of hours, journeys that may previously have taken weeks. Another version of the Nord Express also hangs in the Stadelijk, it is in my opinion no where near as emotive or as well laid out as the one I have focused on. 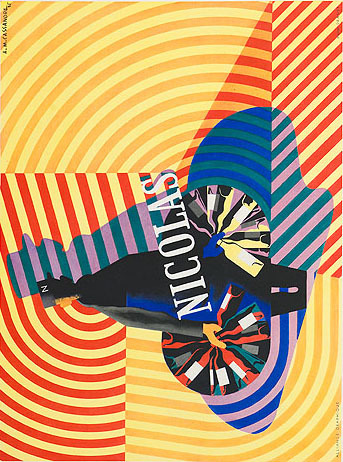 Cassandre carried on producing posters until the world war two, during which he joined the French Army. Although he carried on producing posters after the war, even dabbling in theatre and costume design, his passion was never the same as it had been in the golden years of the 20’s and 30’s and after struggling with depression he committed suicide in 1968. 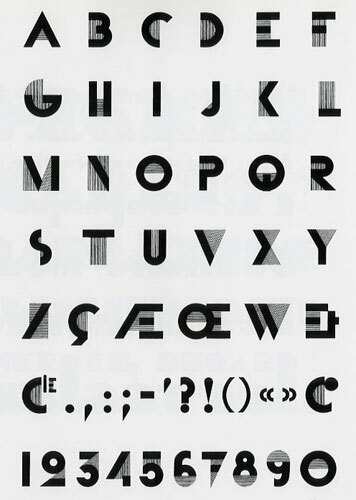 His most famous works include amongst others the Yves-saint Laurent logo and the ingenious new typeface Peignot. How ever much of a genius A M Cassandre is, much of the posters appeal for me is the style and the time it was done in makes this poster stand out. It was designed during a time of great hope and prosperity. After the great war people began once again to rebuild there lives which would become bigger and better, more accomplished. Art Deco is the embodiment of these ideals. It promotes the eclectic form associated with elegance, style and modernism. It takes its inspiration from mathematics and geometry, perhaps a representative of people trying to rebuild for a better future. 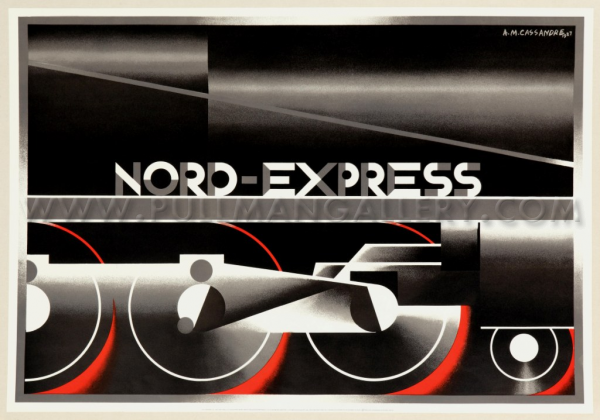 It is this that is so evocative not just in the Nord express but also in many of A M Cassandre’s works, they demonstrate a great feeling of hope, excitement even glamour. People of the time really had a vision of how the future might look like, it was a time of huge invention of enterprise. Art Deco was representative of elegance, functionality and modernity all of which are embodied by A M Cassandre’s Nord Express. The first time I went to the Tuschinksi theater I must have been somewhat around 10 years old. It made a huge impression on me, between all the ugly stores and cheap restaurants, a beautiful building with butterfly cocoons and metal trees. Remembering this I decided to rediscover this building when we got the assignment on the “Wendingen” magazines. So with my camera I went there, the building was still as impressive (looking a bit smaller though) and from the entrance to the loge it was a real joy. There is so much detail at first it looks like scribbling, but after a while I could focus on individual parts of the interior. Behind the bar there are three heads, enlisted by glass birds in blue and yellow. The walls mostly covered by paintings and endless woodwork. And the many lamps, in all possible shapes. Mostly they look like stylized insects. But when I asked a lady if she maybe had some information on the theater and the lamps and glass-work specifically, she told me no. Also, sadly, I could not go past the entrance hall. Luckily I was allowed to take some pictures [x]. In my research project I became very interested in some paintings that I found in one of the Wendingen magazine I researched. It was very strange to see some issues about Pyke Koch or Klimt because Wendingen was a monthly publication aimed at architecture and interior design. I am wondering why the chief editor who was the architect H. Th. Wijdeveld decided to publish some issues about paintings in this magazine which appeared from 1918 to 1932! After the First World War in Europe it was a difficult and depressing period. For the young hoping for careers in architecture, painting, sculpture or interior design the prospects were bleak, with preference inevitably going to older and more experienced exponents with establish reputations, the fact of being young meant a disadvantage. Even the older generation with a record of solid achievement reaching back perhaps to the days before the Great War found it hard to make ends meet in the drab years of the Depression and anyone fortunate enough to be in safe and congenial employment took care to hold on to his position at any cost. It was quite hard for painters to alone sell of their works and many artists started to paint decorative elements screens for interior decorators or to design china or textiles. It presented good opportunities to earn some money. On top of all that, a new movement – Art deco started to come in use. Art Deco took place in various subjects including architecture. Frank Lloyd Wright was at the end of the nineteenth and beginning of the twentieth century the American architect credited with the invention of the skyscraper. 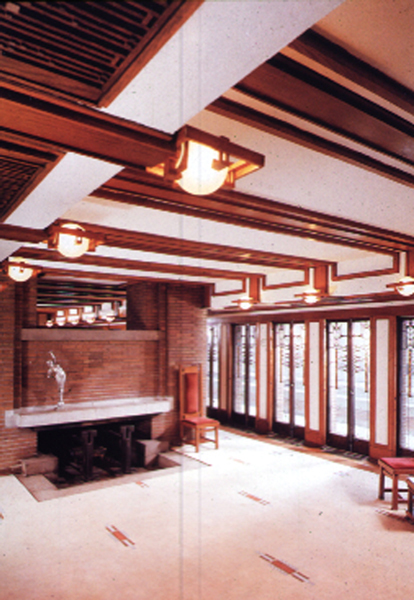 Wright was instrumental in fashioning a specific American Tradition of modern decoration upon which American Art Deco was built. This is particularly true of the horizontal style of domestic architecture. The best example is ,,The Robie House’’. Inside of the building you can find a lot of decorative elements. On the wall you can see long, black stripe, on the windows arty stain glass, which bright designs. All these Art Deco elements were influence by a number of other art movements. 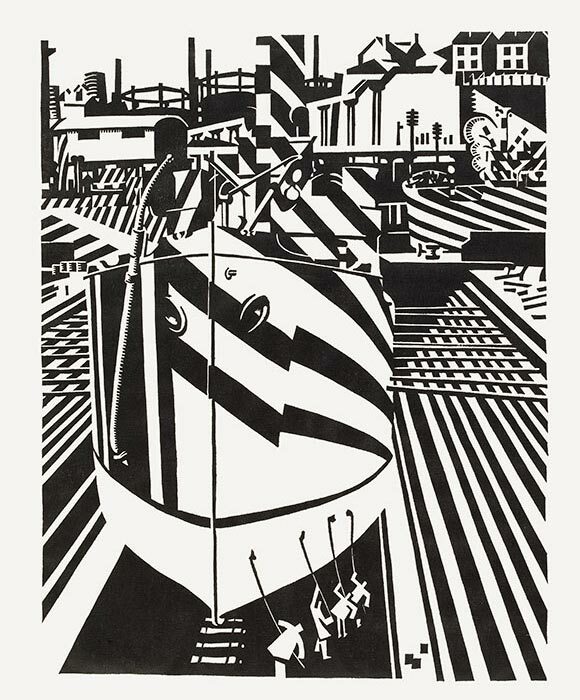 For instance, Edward Wadsworth was one of the main figures in the Vorticism movement. If you look at “The Robie House” walls and ,,Liverpool shipping’’ you can see that Wright using the same concept of a vortex as Edward. You can find the same examples with Art Deco style and Expressionism(forms derived from nature are distorted or exaggerated and colors are intensified for emotive or expressive purposes), Futurism (forms derived chiefly from Cubism were used to represent rapid movements and dynamic motion; showing hostility to traditional forms of expression), Cubism (the reduction of natural forms to their geometrical equivalents). In Amsterdam you can find Art Deco style in Architecture too. One of the most famous building is ,, American Hotel’’. It was built in 1900. 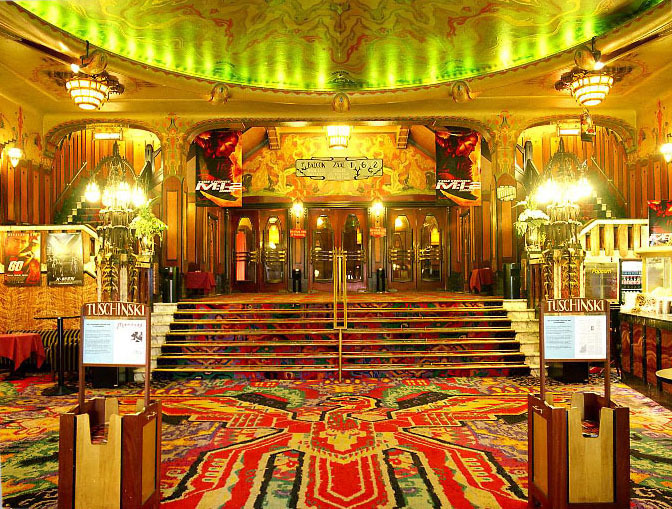 In American Hotel there are many features which are typical of the Art Deco style period, such as the stained-glass windows. Also you can see some paintings which are placed inside. 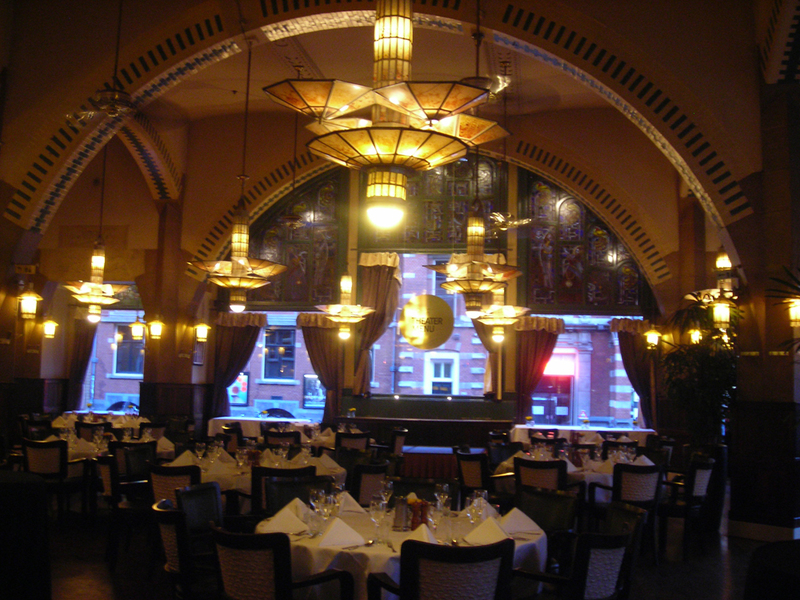 The café American has beautiful interior which reminded me some of Klimt works. Ornaments on furniture (especially on chairs) and colour palette are quite similar like The Café American. Moreover, one of the Dutch artist- Pyke Koch was interested not just in painting and drawing but in interior design too. He created and also made interior designer for the van Dam van Isselt house in Utrecht. Pyke Koch painted on the marble table, garden doors and painted dolphins on the floor. Wendingen magazine was published in 1918 almost in the same period when Art Deco movement started. I think this style was very important in a lot of art fields and it was relevant with architecture and interior design. It can be a reason why in Wendingen magazine you can find some information about artists who was the most concentrate in paintings.